This is a VERY difficult watch to find. 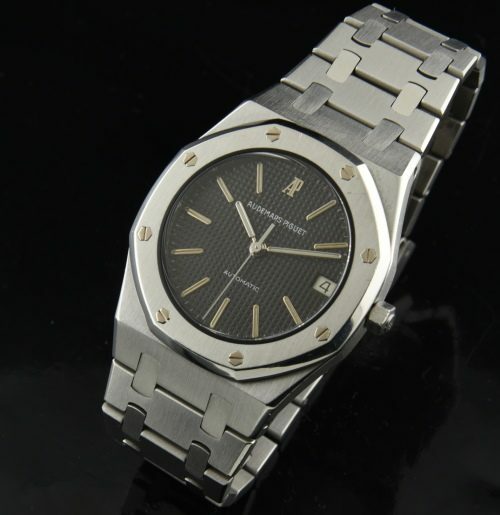 The cult classic circa 1980 AUDEMARS PIGUET Royal Oak reference 4100 in stainless steel measuring 35mm. and only 7.25mm. thin. The black original dial and handset looks amazing-no flaws. The steel case has only minor marks. The bracelet looks excellent. One screw head in one link is stripped, but really does not affect anything. This watch will fit up to a 7 inch wrist. The original AP crown and sapphire crystal is present. The fine caliber 2123 automatic movement is accurate after a recent cleaning. On the wrist, this vintage AP watch gleams and catches the light with its sharp Gerald Genta designed angles. No box or papers. If you ask me, this is a better looking watch than the Patek Philippe Nautilus and RARER! This is a fine original example at a great price, and destined to increase as the years go by. A true investment in time.